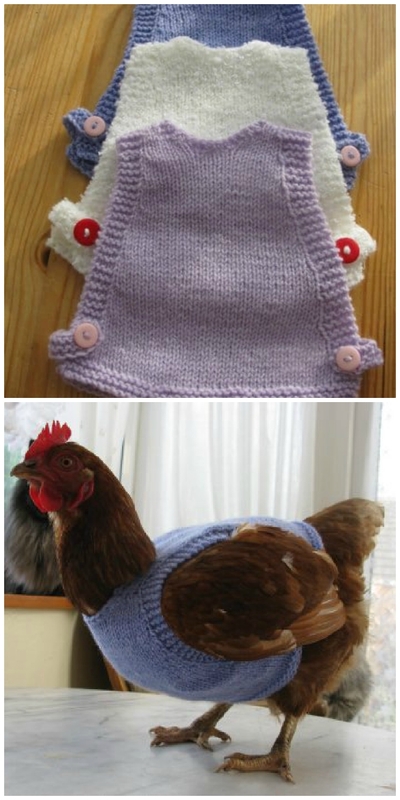 You’ll go clucky for these fabulous Knitted Chicken Sweaters Free Patterns and they are seriously cute! Check them out now and be sure to Pin your favorites. 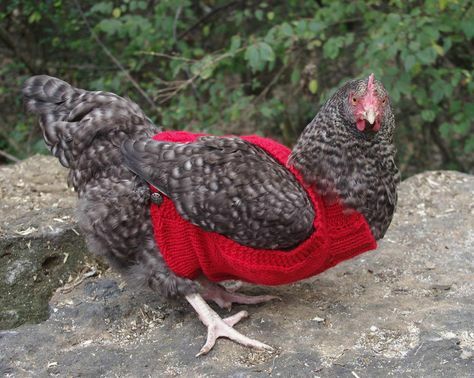 Your backyard Chooks will look so good in this Free Knitted Chicken Sweater Pattern and they’d make fun Photo Props! 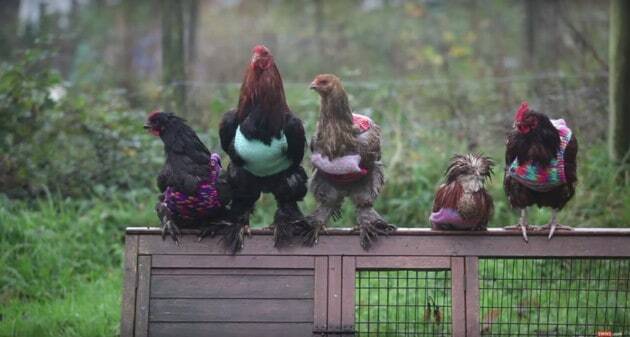 These Patterns were used to keep rehabilitated Chickens warm while they were growing back their feathers. 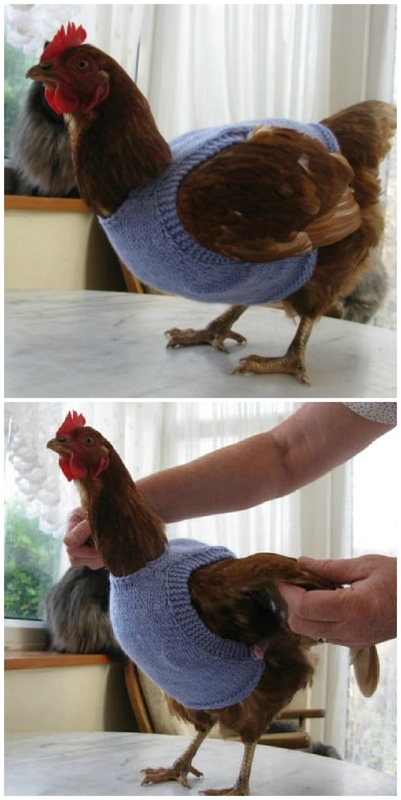 This handy Chicken Sweater Free Knitted Pattern was sent to us after a member of our Community found it on Facebook. We’ve also included Crochet Egg Gatherer Apron for you further down our post, It’s been another hugely popular idea on our site so be sure to check it out. We have linked to the Forum where they were found, be sure to get some pics of yours and please send them through so that we can share with our community. 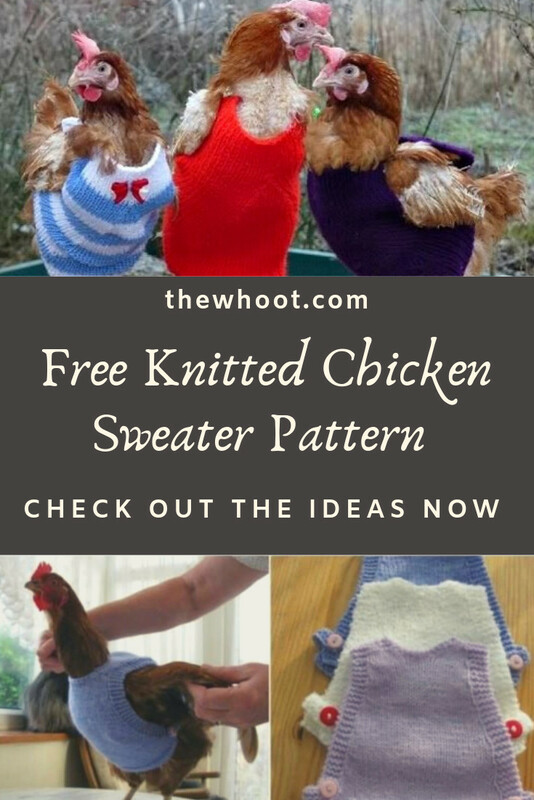 If you are ready to make these adorable Knitted Chicken Sweaters, you can find the free pattern on Hencam. Here’s another fabulous idea, we love this Egg Gatherer Apron. This is a crochet version and it’s a fabulous free pattern. 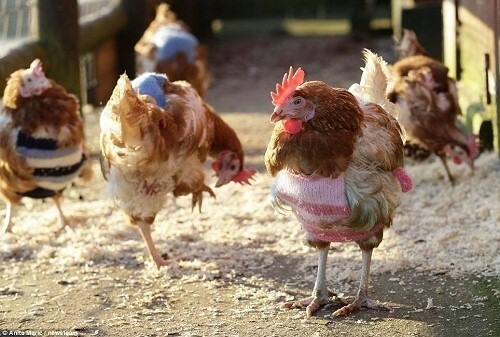 Here’s one of the recipients in his Knitted Sweater at Lee Valley Park Farms. The hens arrived from the British Hen Welfare Trust. They are recovering with the help of warm knitted jumpers, made by members of the public. This little guy arrived with 2 Meerkats and 23 Battery Hens. 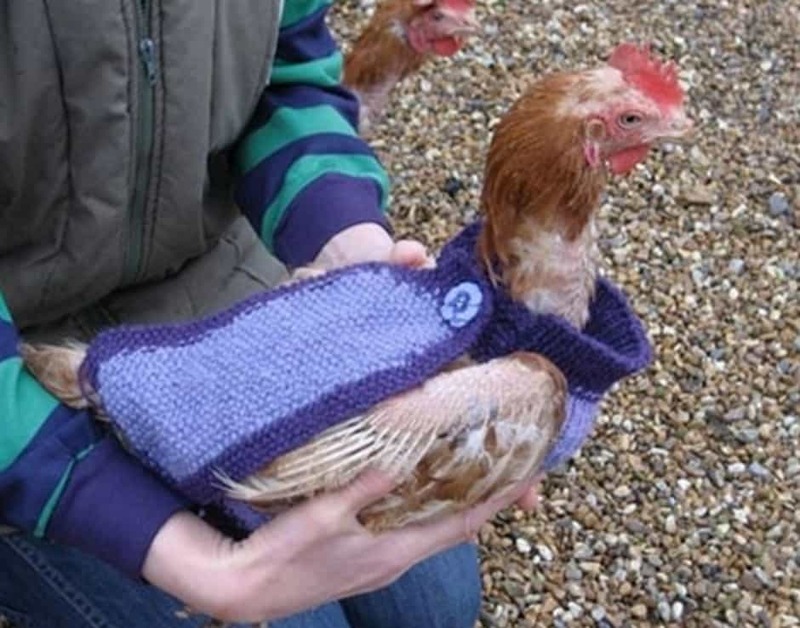 The Helping Hands knitting circle have been making jumpers for bald chickens across the country. 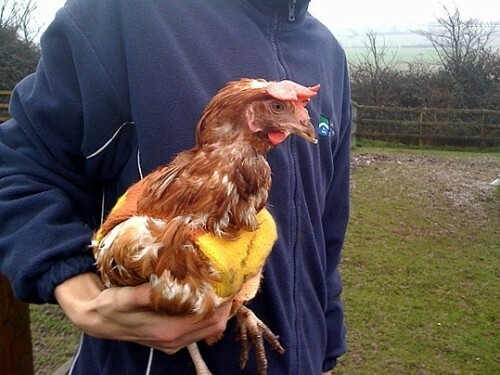 Ann Duran, 55 took pity on Hens left featherless after being rescued from a battery farm. 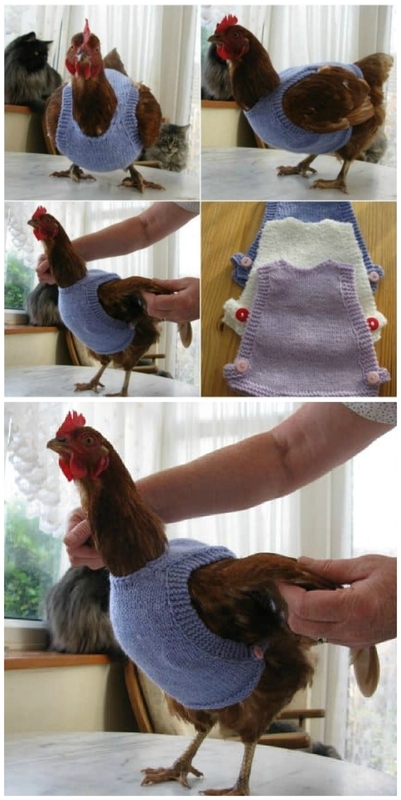 She came up with eggs-actly the right answer to keep them warm hand-knitted tanktops. Ann said: “Some people think I am crazy but I didn’t like to think of chickens shivering through winter. 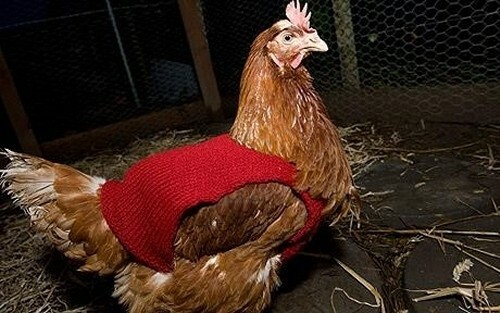 A mother and daughter in Cornwall, England, is knitting and selling sweaters for rescued battery hens, who spend most of their lives laying eggs in cramped cages. They’re donating proceeds to an AIDS orphanage in South Africa.